Production by Viking Tool & Gage, Inc.
Viking Tool and Die's production department provides many services, such as CNC milling, CNC turning (w/ live tooling & bar feeders), high speed production sawing, miter sawing, metal stamping (including several coil lines w/ progressive die capability), vibratory and brush deburring, washing, and assembly. Viking can also offer many value added processes such as welding, anodizing, powder coating, and more. Our 3 shifts of production enable us to provide our customers with quick turnarounds and a 97% on time delivery rate. 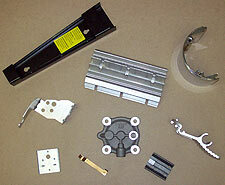 Also aiding in our production output is our pallet changers, bar feeders, and hydraulic fixturing on our CNC machines. Our services industries include: medical, automotive, furniture, construction, heavy equipment, and many others.